Zulu News TV: Is the ANC now controlled by Guptas? Brothers Ajay, Atul and Rajesh (also known as Tony) Gupta, all in their 40s, relocated to South Africa from India's northern state of Uttar Pradesh in Saharanpur in 1993, just as white minority rule was ending and the country was opening up to the rest of the world. 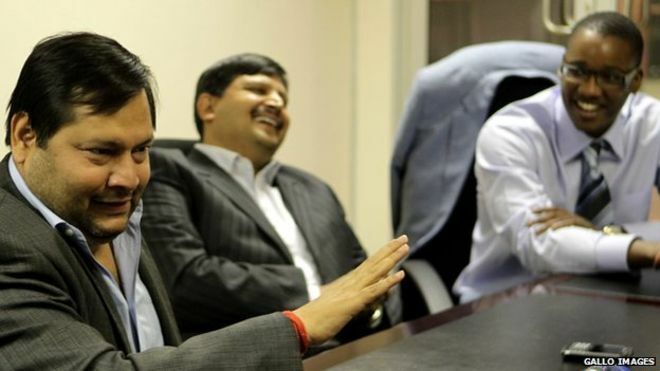 Atul says they met President Zuma 10 years ago "when he was a guest in one of Sahara's annual functions", a computer peripherals company the Guptas own. One of Mr Zuma's sons, Duduzane, is also director in some of the Gupta family companies which seldom loses in tender bids. The president's daughter Duduzile w Zuma was also appointed as a director of Sahara Computers in 2008, six months after her father was elected as ANC president, although she has since resigned. This has prompted senior leaders within the Tripartite Alliance speak out against the perceived influence of the Gupta family over government, there have been questions about whether the inaction from within the state has led to a culture of patronage. The Sunday Times reported yesterday that South African Communist Party (SACP) and Congress of South African Trade Union (Cosatu) leaders sharply criticized the perceived influence of the Gupta's during the ANC’s lekgotla held last week. They reportedly criticized the manner in which senior ANC members are summoned to the Gupta's Saxonwold compound to discuss government matters. Senior analyst at the Institute for Security Studies (ISS) Judith February says it may be too little too late. The Gupta brothers have been terrorizing the South Africa government affairs and exerting their influence with sheer ease.